In the United States, there are around 200,000 ACL tears each year and 100,000 ACL repairs are performed on these tears annually. High school, college, and professional football players often experience ACL tears, which can greatly affect their athletic careers. Approximately eight percent of all football players of the National Invitational Camp have a history of ACL injury, with six percent requiring reconstruction. injury are never able to play again. Also, women athletes are at even higher risk for ACL injury, especially those who play sports that require rapid change of direction maneuvers. To repair an ACL injury, many orthopedic specialists choose to perform a bone-patellar tendon-bone autograft surgery. 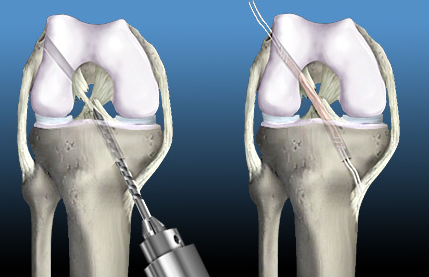 The bone-patellar tendon-bone autograft is one of the most commonly used techniques. 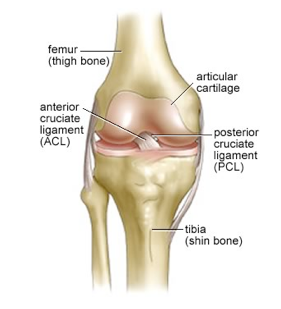 The knee joint contains four major ligaments that provide stabilization: the anterior cruciate ligament (ACL), the posterior cruciate ligament (PCL), the medial collateral ligament (MCL), and the lateral collateral ligament (LCL). The ACL and PCL keep the tibia in alignment and prevent rotation of the knee during extension. The knee joint must support the entire weight of the body, and the synovial fluid and meniscus serve as a cushion. Synovial fluid is a lubricant inside the joint, and the meniscus is a cartilaginous layer of tissue between the tibia and femur bones. The bone-patellar tendon-bone autograft surgery is a primary repair to sew the damaged ACL back together using graft materials. This extra-articular repair involves manipulating structures on the outside side of the knee to increase function and prevent excessive side movement of the tibia. The autograft is obtained from the patient, whereas an allograft comes from a cadaver. The grafting procedure is done as opposed to sewing the two ACL pieces back together, which fails over time. Autografts are stronger than allografts, they do not transmit disease, and they are indicated in patients who require revision ACL surgery who want to return to lower demand activities. Autografts are preferred over allografts also because they come from the patient’s own tissue and are less likely to be rejected. The two autografts most often used are the patellar tendon and the hamstring tendon. These are removed along with the piece of bone at each end of the patella and tibia. One disadvantage to this procedure is that it may put the patient at risk for patellar tendon rupture or patellar fracture. Brophy R, Gill C, Lyman S, Barnes R, Rodeo S, Warren R. Effect of anterior cruciate ligament reconstruction and meniscectomy on length of career in National Football League athletes: a case control study. The American Journal Of Sports Medicine.